Michigan State's regular season-ending clash against Penn State will be the national game across most of America Saturday, the only exception being a small swath of ACC country from Georgia to Washington D.C. The battle for the Land Grant Trophy is the ABC national game in most major alumni markets like Michigan, Chicago, Orange County, Texas, Denver and New York. 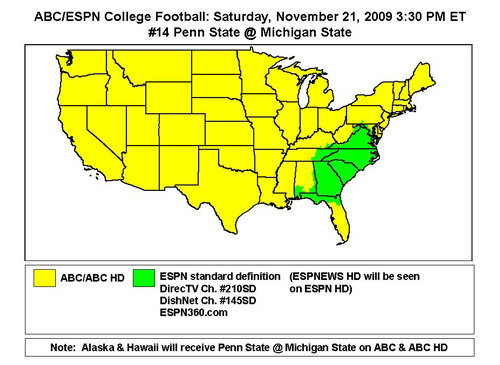 Alaska and Hawaii, not pictured at left, will also get MSU-Penn State on ABC. ESPN will carry the game for the rest of the country, but strangely enough, only in standard definition. ESPN News will run on ESPN's HD channel. I don't really understand that call, but apparently someone in Bristol thinks the rest of the country doesn't need to watch football in high def, but needs their studio news recap in crystal-clear HD. FYI, the game opposite ours is Virginia @ Clemson.